I usually take days off from work around my birthday, but this year I had projects hitting at work and decided it wasn’t the best idea. So I delayed the time off until this weekend. I’m taking a half day off tomorrow and full days Monday and Tuesday. 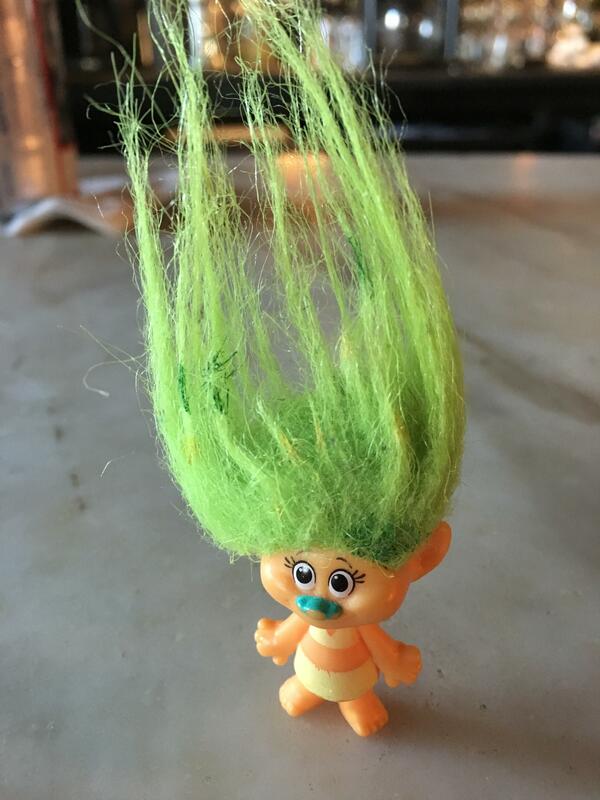 Back on the Friday before BBQ Fest, at the start of a full week vacation, I started a new tradition at happy hour at the Silly Goose: I pulled out my little green-haired troll and danced with her. Ever since, any time I have extra days off, I dance with the troll. If you want to see me dance with the troll, I’ll be at Silly Goose not long after it opens at 2 tomorrow. PAINT THE TOWN TIGER BLUE! From WREG: First United Methodist rises again after a 2006 fire. The church is located at Poplar and N. Second and rebuilding is about 70% complete. Ghost River’s Thirsty Thursday club kicks off today in the taproom. Drink 10 pints and become a member. Members get $4 pints. Friday from 4 to 8 PM Sabor Caribe at 662 Madison will offer a $10 Arepas Combo (with a side) to St. Jude runners. They will also have $3 local beers. That’s it for now. Back tomorrow (or maybe lunchtime today) with more news. OK… I hate to be a Debbie Downer but here’s something that worries me a bit. UCF has a perfect record and is 14th in the playoff rankings. Memphis has only one loss, to UCF, and is 20th in the playoff rankings. UCF beat Memphis 40-13 during the regular season. Everyone is saying that the winner of the AAC Championship Game goes to the Peach Bowl, but actually, the highest-ranked Group of 5 team in the final CFP rankings goes. What if Memphis wins 42-41 Saturday? Are we SURE the committee would move Memphis above UCF? Or would they move Memphis up and move UCF down, but because of the more lopsided victory keep UCF above Memphis, sending UCF to the Peach Bowl? Don’t feel like traveling out to Collierville to sample brews from Meddlesome, Memphis’ newest brewery? You can get their blonde ale Downtown. Got info on two parties where the kids can meet Santa in Downtown Memphis. This Saturday, December 2, Trolley Stop Market will offer a Pizza Party with Santa. In addition to pizza, there will be cupcakes, cookies, and crafts. You can get your photo taken with Santa and there will be bingo at 7. Call 901-526-1361 to make reservations. Cost is $5 per child. The following Saturday, December 9, there’s a breakfast with Santa at the Fire Museum. Kids can climb on the fire engines! The Phantom of the Opera opens tonight at the Orpheum and will run through December 10. The Head Coach J.B. Bickerstaff Era for the Grizzlies begins on the road tonight in San Antonio. Here’s a preview. Wiseacre will host a Tacky Sweater Party Friday, December 15 with The Mighty Souls Brass Band playing from 6:30 to 9. Beer discounts from 1 PM on for those dressed for the occasion, and the tackiest sweater will win an additional prize in the evening. There will be milk (stout) along with cookies from Kaleidoscope Kitchen in the tented outdoor pavilion, and the Gourmade food truck will be on site. Interesting: The TSA confiscates 20 to 30 pounds of BBQ sauce at the Memphis airport per week. You can’t bring a bottle of sauce though a checkpoint if it is bigger than 3.4 ounces or 100 ml. What you can do is have it shipped or put the sauce bottle in checked baggage. Time to keep an eye on the news this afternoon. Will a coach be fired? Will a celebrity or politician be accused of sexual assault? Will a member/former member of Trump’s team be indicted? These days you never know. Back tomorrow with more news. Wow. Fiz is gone. For those of you who haven’t heard yet, the Memphis Grizzlies fired head coach David Fizdale yesterday afternoon. The firing came after eight straight losses and Marc Gasol benched by Fiz for the entire fourth quarter of a loss. Hard to believe this came only 7 months after “They not gonna rook us” and “Take that for data!” Here are some reactions around the NBA and around Memphis. Another (adjective)(animal) place will soon open Downtown: The Gray Canary. This will be the new Hudman/Ticer restaurant in Old Dominick Distillery on Front Street. It will have wood fire and a raw bar. The Brass Door will have pre-marathon pancakes and porridge for St. Jude runners Saturday, opening their doors at 6 AM. For runners not familiar with Downtown, the Door is an Irish restaurant and pub two blocks north of AutoZone Park, on Madison between Second and B.B. King. Following the race the Brass Door will be open with post-race revelry as well. Pontotoc Lounge will host a Repeal Day Celebration on December 5, the anniversary of the 1933 end of Prohibition. Doors open at 4 and there will be ’20s and ’30s era jazz, cocktails and a food menu. Classic Cocktail happy hour at 4, punch pours beginning at 6, and jazz starts at 6:30. The combination Downtown Neighborhood Association and South Main Association holiday party will happen Sunday, December 17 at Jack Robinson Gallery, corner of Front and Huling. Pam & Terry will provide the live music. There will be catering by Arcade Restaurant and Marcy Siebert, and complimentary wine and beer. This party will replace the December monthly SMA meeting. Another fairly slow news day. That’s it for now, back tomorrow. Cheers to heroes! This coming Saturday, December 2, thousands of people will run the St. Jude Marathon, Half-Marathon, 10K, 5K and 1-mile family walk, raising millions of dollars to help ensure that no child’s family ever receives a bill for cancer treatment at the children’s research hospital. Expect delays if you have to drive… a better idea would be to leave the car at home and come out and show your support for the runners. Expect the bars to fill up quickly on Saturday, with runners post-gaming and people turning up to watch the American Athletic Conference Championship, Memphis vs. UCF, on ABC at 11 AM. Then the Memphis Holiday Parade happens at 2 on Beale Street. After the parade the bars will fill up again for Georgia vs. Auburn in the SEC Championship. It will be broadcast on CBS starting at 3 PM. The Memphis Tigers host Mercer at FedExForum at 4 Saturday. The food hall at 409 S. Main has its grand opening Saturday. And then at 7 the annual Stumbling Santa pub crawl assembles at the Flying Saucer, with more than 1000 Santas stumbling from bar to bar. In summary, Saturday is going to be a huge day Downtown. If you plan on coming down here for any of the day’s events, allow extra time for traffic and parking. It will be busy! On to other news… local BBQ team Porkosaurus has a marketplace on Amazon where you can order their sauces, spices and rubs. Great holiday gifts if you know a person who loves BBQ. The U of M is negotiating a new contract with Mike Norvell. Smart move. Stats site FiveThirtyEight has an interactive college football playoff predictor where you can give teams wins or losses and see how it affects their chances of being one of the chosen four. The Blind Bear has Wonderful Wednesday this Wednesday night, with trivia at 8 (free to play; chance to win a $40, $20, or $10 gift card) and then Charvey Mac at 10. Wait a minute, that means Charles is actually going to have to get trivia done by 10! LOLing at the situation with Schiano being hired and then not hired at UT. You remember those prank matches that won’t stop burning? The Vols’ football program is the dumpster fire that won’t stop burning. That’s it for now. Back at work after a long and eventful weekend. Back tomorrow with more news. I’m gonna let this one speak for itself. Fries, onions, corned beef, cheese. There will be a Big Wheel Race on Beale Street today, starting at 1 PM. This is presented by the Beale Street Merchants Association and benefits the Salvation Army Angel Tree program, getting Christmas gifts to kids who might not otherwise have them. If you want to pitch in, bring an unwrapped, unopened toy to any business on Beale. Tubby and the Tigers host basketball powerhouse Northern Kentucky at FedExForum tonight at 7. This is one of these games that’ll get Memphis’ strength of schedule rating well into the Top 300 come March Madness time. Pilates, Poke and Pints comes to the Ghost River taproom this Thursday, November 30 at 5:45 PM. Club Pilates East Memphis will conduct a one-hour Pilates mat class. $15 pays for the class and a cold beer afterward, with net proceeds benefiting the Ronald McDonald House. Ono Poke will be there with snacks and fuel. There’s a burlesque show tonight at Earnestine & Hazel’s. $10 admission. I’m gonna need a place with lots of TVs to keep up with all the action. Back tomorrow with more news, or Monday if Thanksgiving weekend continues to be a slow news weekend. As for the Downtown core hotspots, Flying Saucer opens at 5, Blind Bear at 6, Silly Goose at 7. I haven’t confirmed this but Bardog usually opens at 5 on Thanksgiving and serves a Thanksgiving dinner special. Brass Door is closed today. 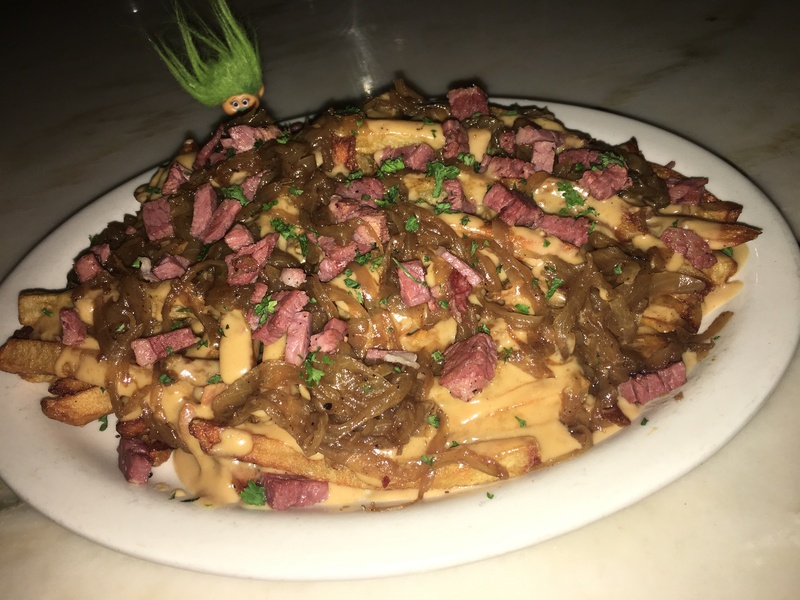 By the way, Brass Door has an item on its bar menu called “Irish Nachos.” Hand cut fries covered with beer braised onions, corned beef, and cheese dip. Yum!!! I must try those soon. Got beer news from a couple of great Memphis breweries. Ghost River will have a release party/retirement party Saturday, December 2 from 5 to 10 PM. SMASH Test Dummy is a Double IPA and Dummy’s daddy Mike, the beer’s brewer, is retiring. Just one more of many reasons for Downtowners to celebrate the first weekend of December! Chocolatier Phillip Ashley takes over the Wiseacre taproom this Saturday 2-5 PM. For the past year he has been collaborating with the Wiseacre brewers on Charlemayne, a barrel aged Belgian Stout with Peruvian cocoa ribs and orange zest. This week Wiseacre returned the collaboration favor, going to Phillip Ashley’s place and experimenting with cocoa butter, melted chocolate, caramel, cream, brandy and beer to come up with a batch of super fancy chocolates. Both the beer and the chocolates will be for sale at the taproom on Saturday. The Madison Hotel will be laying off over 30 workers in January. It will temporarily close its restaurants eighty3 and Twilight Sky Terrace for improvements. The hotel itself will remain operational through this period. Statistic site FiveThirtyEight says this Saturday’s Iron Bowl matchup between Auburn and Alabama could be their biggest game ever. There are playoff implications for both schools and for Georgia. I am rooting for Alabama to clobber Auburn Saturday, and it’s not because I’m a huge Tide fan or have anything against the Tigers. However, if Auburn misses the SEC championship and the CFB playoffs, Arkansas is more likely to woo Auburn coach Gus Malzahn away to Fayetteville. Lifehacker suggests that you should get drunk and cause a scene today at family Thanksgiving. Someone’s going to do it, might as well be you, and as they point out, if you strike first then you get to set the tone and tactics. Vanity Fair has an exclusive on the intelligence President Trump let slip in a May 10 meeting with Russian foreign minister Sergei Lavrov and Russian ambassador to the U.S. Sergei Kislyak. The intel was passed to the U.S. by Israel, and no doubt once it was shared with the Russians, it made its way to Iran, Israel’s sworn enemy. Hurry up, Mueller… we have got to get this narcissistic, sociopathic kook out of office soon. Getting some housecleaning done as I wait for a Friendsgiving event that starts at 5… looks like the cherry pie is going to make it there after all. I’m off tomorrow and you know what that means – BARDOG BARDOG BARDOG. They’re going to see a lot of me the next two weeks, as I am extending Celebration Weekend next weekend through Tuesday, December 5. That’ll do it for now. Back tomorrow if there’s enough news for a post. This morning I got to Horn Lake a bit early and picked up a really nice-looking cherry pie for a Friendsgiving event tomorrow. All morning I’ve been thinking about that pie. Mmmm… all I have to do is walk outside and open my trunk to get it. If I show up to Friendsgiving tomorrow with bottled water as my contribution, you know what happened to the pie. Sunrise Memphis will open at 670 Jefferson in the old Neely’s space on Monday. Foods like sausage, bacon, grits, pancakes and hashbrowns are expected to be featured. A Bi Bim Breakfast appears to be slated for the menu as well. There will be a grab & go case, and a jukebox with classic tunes has been added to the space. “Like” Sunrise on Facebook for news and updates. The monthly Downtown Neighborhood Association meeting will happen at The Arcade Restaurant next Tuesday, November 28 with social at 6:00 and meeting at 6:30. The theme will be “The Latest Grit ‘n Grind News” and the speaker will be Jason Wexler, President of Business Operations, Memphis Grizzlies. Wexler is responsible for all aspects of the business behind the team. Come hear Grizzlies news and updates on improvements to FedExForum, followed by a high-energy Q&A. Appetizers by The Arcade and a cash bar. Free for DNA members, $10 for non-members. Grizzlies 6-game Holiday Packs go on sale today. Games in the packs include the MLK Day game with the Lakers and a game vs. LeBron James and the Cleveland Cavaliers. Recipients of the packs will get, in addition to tickets to the six games, a Grizzlies scarf and a $10 Bass Pro gift card. Five seating options are available, ranging from $15 to $99 a game. Chip Kelly has turned down the Tennessee head football coaching job. No reasonable person would want to be in charge of that dumpster fire of a program. I’m thinking about going down to Max’s Sports Bar on Saturday to root for Vanderbilt to hand the Vols an 8th straight SEC loss. Maybe Vol fans will decide to stop associating with losers and then the Vols will have no fans… nah that’ll never happen. Not a whole lot of news today, pretty normal for the day before Thanksgiving. I’m out of work early this afternoon and I plan on staying out late. Happy Thanksgiving, just in case I don’t find sufficient news to report tomorrow. A City Council member is introducing an ordinance that would allow people to walk down Main Street, from A.W. Willis to G.E. Patterson, with a drink in their hand. Hmmm. Interesting idea but I’m not sure how I feel about it. As the people at the Arcade said in the news story, I worry that it would change the relaxed character of Main Street. I can handle my neighborhood turning into Amateur Night on New Year’s Eve, St. Patrick’s Day, and Music Fest, but not year ’round. The Memphis Flyer and Memphis Business Journal have articles on the new food hall at 409 South Main. It is already open and is having its grand opening Saturday, December 2. It will contain seven restaurant and cafe concepts. I went to a similar food hall in Little Rock earlier this year and have become a big fan of food halls. The grand opening is yet one more reason to celebrate the first weekend of December! Those hot chips are gooood. Better have a cold drink handy though. You will need it! Holly has a list of places open on Thanksgiving in Memphis. Insider tip I got this past weekend: The mussels at the Brass Door are really good. You get a big portion for your money and they come with a cream wine sauce and Irish bread for dipping. If you love to listen to the Chris Vernon Show, you can now watch it as well, live at noon. You can either watch on the Grizzlies website or watch on the Grizzlies mobile app. Downtown Memphians, Black Friday is your opportunity to see the Memphis Hustle, the Grizzlies’ affiliated developmental league team, without getting in your car. The Hustle normally call Southaven’s Landers Center home, but Friday they will play a home game at FedExForum at 7. Also on Black Friday, 2018 Memphis in May Beale Street Music Fest passes go on sale. A limited number of 3-day passes will go on sale for $105 on Friday. Goat yoga has found its way to the Memphis area. The Flyer reports that once a month you can do yoga with goats on a farm in Rossville. YOGA! The Memphis Tigers host New Orleans tonight at FedExForum at 7. Pizza with Santa is back at Aldo’s Pizza Pies Downtown Saturday, December 16 from 12:30 to 3 PM. Kids can drop off their Christmas lists to Santa and decorate cookies. Amurica will be there for photos. Aldo’s is requesting the donation of an unwrapped, unopened toy or a monetary donation for Toys for Tots. Downtown Dining Week wrapped up yesterday, and I stumbled upon quite a value. I went to Rizzo’s by Michael Patrick for brunch. I took a seat at the bar and Colin handed me a Downtown Dining Week menu. “Three courses for brunch, that’s a good deal for $20.17.” I thought. Then I looked at the top line on the menu. I was wrong about the price. It wasn’t $20.17. It was $10.17. 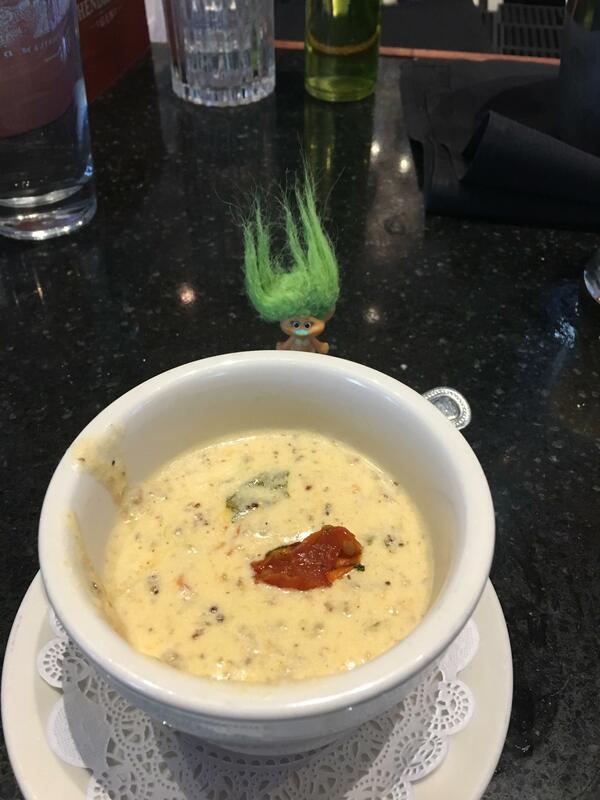 I started off with Chef’s signature cheeseburger soup. 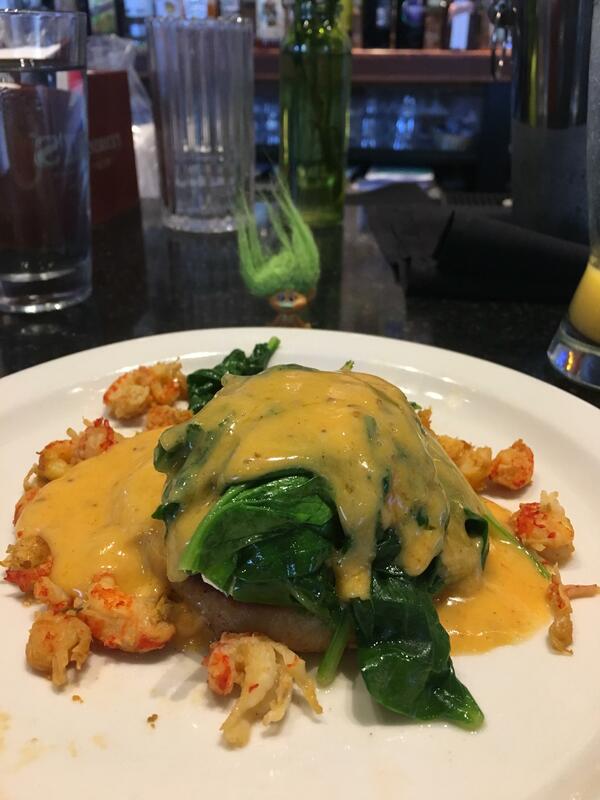 For my main course I selected crawfish eggs Benedict topped with spinach. 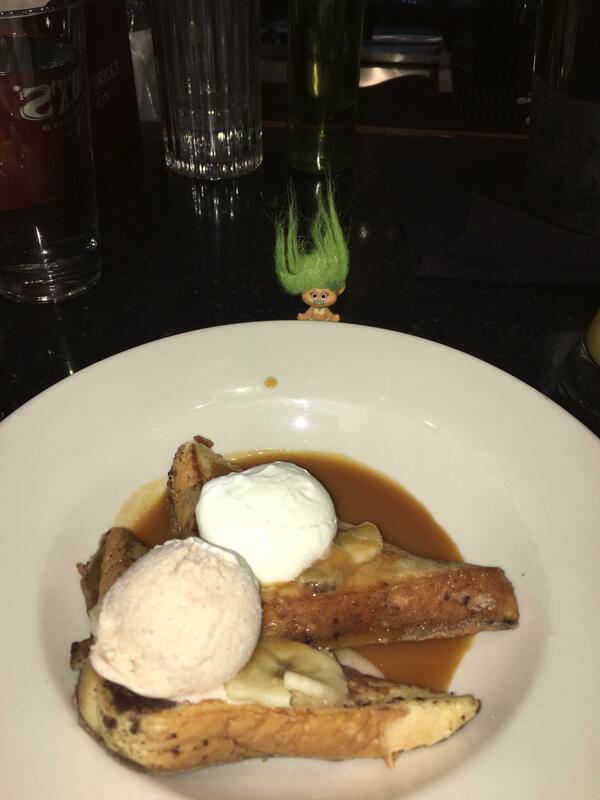 I finished my meal with a dessert of bananas Foster french toast. All of it so good! To drink, I started off with one of Colin’s Bloody Marys, then ordered a bottle of champagne and made mimosas. An incredible deal on some amazing food. Kudos to Chef on doing Downtown Dining Week right. I will definitely be back there soon to try the regular brunch menu… maybe even as soon as this coming Sunday.